Given the forecast for wet weather all day Monday we decided to make an early morning start back to east Vancouver Island and the Comox area. First stop however was for breakfast in a nice little cafe right by the Tofino waterfront. Not only did we enjoy a hearty and very reasonably priced breakfast but even more important, we could see two California Sea Lions lazing around in the nearby marina. For Brian this was a catch up mammal and he rushed outside to get a picture or two. 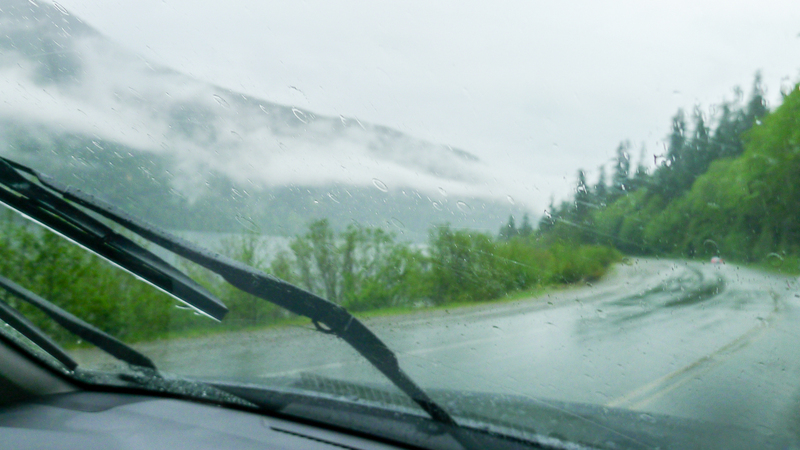 The rain was falling steadily as predicted so we drove straight across the island to Comox without any stops. A Wet Drive from Tofino! By the time we reached the Comox area the weather improved somewhat so we decided to explore the area a bit. We drove out to Goose Spit where there were no birds of interest but we enjoyed watching two fellows "wind surfing", basically using a large kite to pull them and their surf boards back and forth across the bay. Very impressive! A Hudsonian Godwit had been reported in the vicinity so we drove back to the indicated location to look for it. Upon arrival we had a stroke of real luck. We met a gentleman by the name of David Routledge who we soon realised was very knowledgeable about birding in the area. He had seen the Godwit previously and took us to the spot. Unfortunately the tides were wrong and we had no exposed mudflats so not too many birds were in attendance - including the Godwit! We did however see what looked like a Cinnamon Teal/Blue-winged Teal hybrid and a few dowitchers were around too. David offered to show us a couple of places where Green Herons were possible. This had some real appeal for us as we missed them in our recent Ontario trip. En route to the Green Heron spot, we came across a Whimbrel and a small flock of Greater White-fronted Geese. There were no Green Herons on location however so we invited David to lunch at the local Timmy's and chatted about birding options in the area. David also knew a lot about the Vancouver Island Marmots on Mt. Washington where we planned to go the next day so we were fortunate indeed to run into him! He also told us about a spot in Cumberland where we could go that evening to watch Vaux's Swifts swirling down into a local chimney to roost for the night. It was still early afternoon however so we drove north to Seal Bay Regional Park and then Kitty Coleman Beach Park, both very pleasant spots but alas, no new birds or mammals were forthcoming. The highlight for the day proved to be our evening visit to Cumberland to see the Vaux's Swifts David had mentioned. Apparently these swifts have migrated all the way from South America and their travels are not over yet! 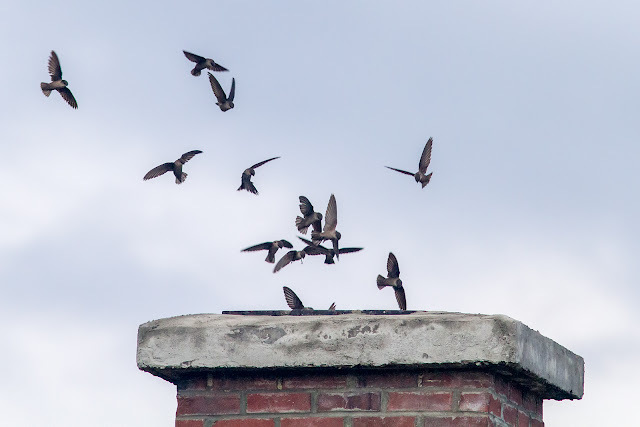 Watching several hundred of these birds swoop down and disappear into an old brick chimney is truly a spectacle worth seeing. Tuesday was our day for Mt. 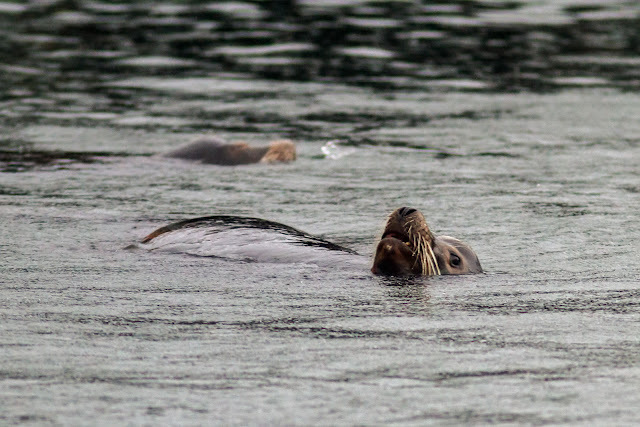 Washington and the Vancouver Island Marmots! We had done our research on these critters and had a pretty good idea where to look for them. We set off from Comox at 5 am and arrived on site before 6 am. At first things didn't go well. The mountain slopes were still covered by lots of snow and we had trouble seeing the rocky outcrops we had hoped for. 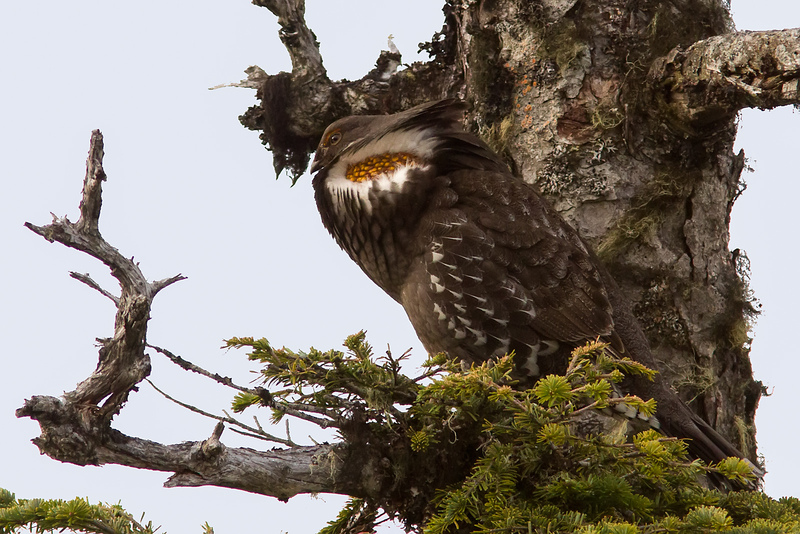 We gave up after a while and focussed on target number two - a Sooty Grouse. This was just as high a priority for us as the marmots and we found one almost immediately thanks to it's very low frequency hooting noise. We were rewarded with fabulous views from about fifty feet away and were able to get a couple of good pictures. Feeling pretty pleased with ourselves we decided to head back to Comox but we made one more stop for the marmot as we began our drive down the mountain. Good job we did! After scanning the mountainside for about 15 minutes, Brian suddenly spotted some movement. For the next few minutes we all enjoyed good views of a single distant marmot as it scurried around in the snow around the base of some large rocky outcrops. This is a very rare mammals species, the survival of which has been the focus of a great deal of effort! We felt very lucky indeed to see one in the wild, even at a relatively large distance. We returned to Comox and celebrated our success by eating far too much for breakfast - again! We tried for the Green Heron again but to no avail so we set off for Nanaimo to catch a ferry for the mainland. We stopped briefly en route at Rosewall Ck. Provinical Park and picked up several good birds for our day list, as well as a Hammond's Flycatcher which is a new team bird for the year. The ferry ride was very quiet for birds so we used the time to grab a quick lunch. Before long we were bumper to bumper in Vancouver traffic, yearning to be back out in the country. Soon enough we arrived at the Pitt Lake region. One of the real joys of this Big Canada Year is discovering new places and Pitt Lake was just such a case. 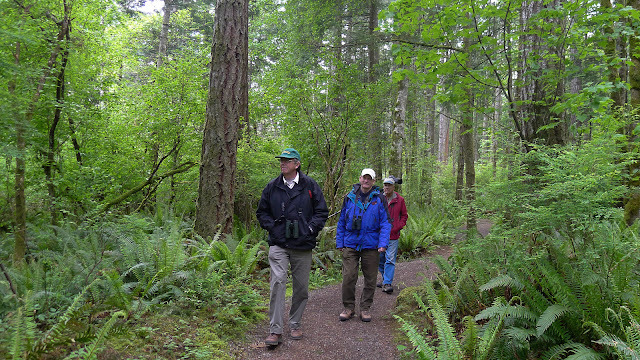 We spent a happy hour or two exploring the area picking up lots of trip birds as well as a Western Wood-Peewee. We also saw two American Beavers one of which was so huge it seemed more like a small Black Bear! The final leg of this rather long day was our run into Hope. 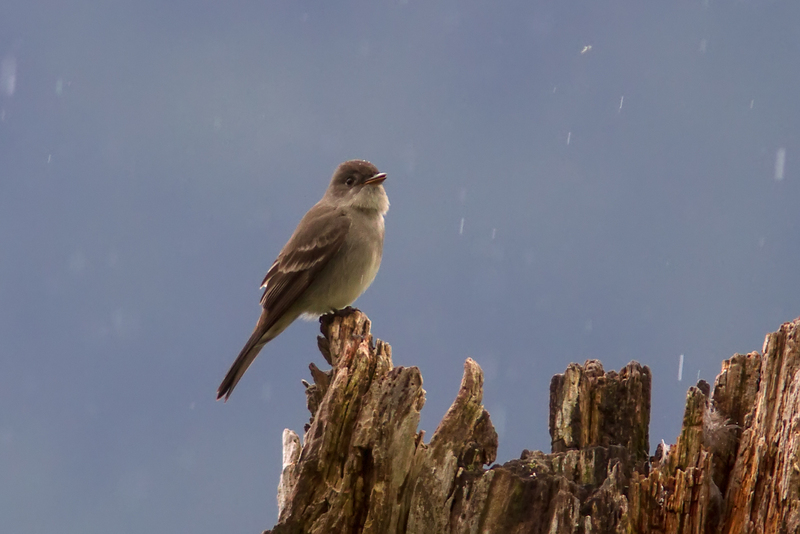 The rain began in earnest once again and we were delighted to arrive at our motel choice for the night and get out for supper and our daily checklist review. Our four new bird species over the past wo days bring our year total to 344. 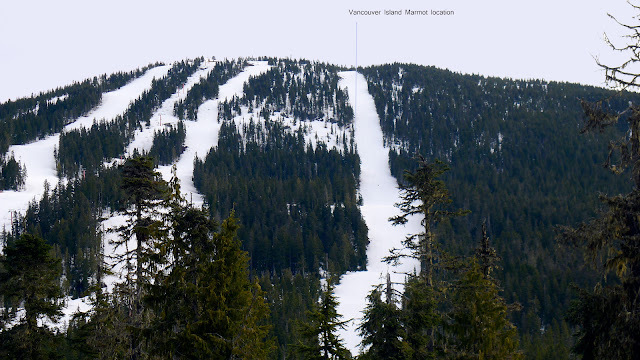 The Vancouver Island Marmot was our 42nd mammals species. That brings us to 386 for our combined total year to date. Tomorrow we drive via Manning Park to Penticton where we'll spend the balance of the week before returning to Calgary.